I am so lucky to be given such a precious tea pot from my younger brother, who knows pretty well of my love for tea. These four medals garnered by the Paio I teapot at the 1998 INPEX exhibition are the most number of medals ever awarded to a single product at an international Invention Exhibition. Its super duper design for easy use can be proven with its quick brewing and preparing of either strong or weak tea with no bitter taste. The tea leaves or tea bags can be simply added into the inner pot, which is made of food-grade Polycarbonate and is temperature-resistance from +137 C to -30 C. Boiling water were then be added into the inner pot before it is cover up to conceal its taste and aroma. The bottom of the inner pot is fitted with a stainless filter together with the stainless water-stop ball. This steel water-stop ball comes with completely leak-proof. Press the button on the cover to let the tea be filtered and flow out from the inner pot to the outer pot. The outer pot is made of glass that may be placed in direct fire. Note that the material can tolerate instant temperature surge of up to 150 C.
Tea will be then be served from the outer pot. You may then continue to brew tea in the inner pot if you choose to do so. Alternatively, you may use the outer pot as a drinking cup instead, if you are not serving any guest. 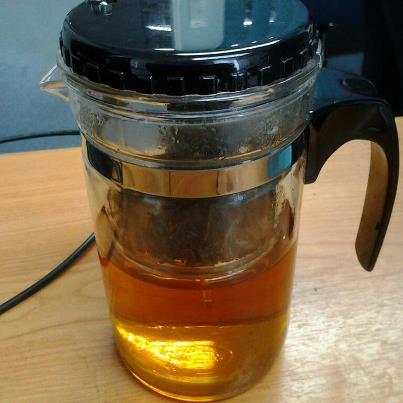 This all-in-one design product makes it feasible for you to use Piao I teapot to brew, filter and drink tea. This handy product is truly perfect for individual use or for serving a small number of guests. Another interesting note is that it will not absorb odor. Hence, it helps to preserve the original taste of tea or coffee. It is yet another added advantage of this innovative product. I found that it is suitable to be used in both office and home. To keep the pot transparent and clear, it is advisable to wash it soonest possible after use. Please keep the inner pot upside down after washing and do not place it upright until it is completely dry. To prevent the product from dropping onto the floor and breaking , kindly place it on a flat surface when using it. Hope you enjoy reading about this new, innovative and creative product. Great appreciation should be given to its creator, who has delivered a much greater and better product.